Dell Continues to Drive Innovation with Incredible Products | Dell today announced a comprehensive new line-up of devices across the Dell Inspiron, XPS and Vostro series. 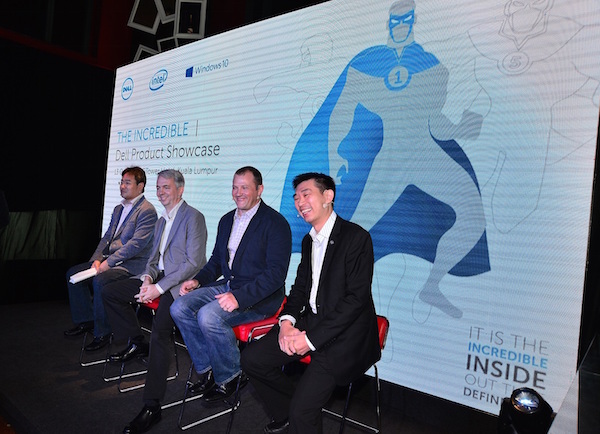 Themed “The Incredible” product showcase, Dell featured a slew of products with an upgraded portfolio to include the high performance 6th Generation Intel processors (Skylake). The Dell PCs also support the new Windows 10 platform and aim to improve customers’ everyday computing experience. “The 6th Gen Intel Core Processors deliver some of the most significant advancements in computing that we’ve ever seen. From desktops to personal computers and 2 in 1s, the 6th Gen Intel Core™ Processor has enabled manufacturers to create the thinnest, lightest and sleekest designs ever. Users can also look forward to amazing new PC experiences like logging into your computer using your face as your password and voice activated personal assistants. Intel is proud to partner with Dell and Microsoft for a new line-up of incredible products, perfect for consumers looking for a high performance device,” said Sumner Lemon, Country Manager, Intel Malaysia and Singapore. Continuing to build on the XPS family’s premium pedigree of form and function, this updated lineup with the XPS 13 and XPS 15 notebooks are designed to offer the best consumer laptops. The new XPS devices boast a number of ‘firsts’ and ‘bests’ in their respective product groups – spanning form factor breakthroughs, display prowess, battery life and more. The XPS 13 and 15 feature premium and ultralight materials such as carbon fiber and machined aluminum, and the entire XPS portfolio has Corning® Gorilla® Glass NBT™ options (only available on touch displays), stunning panels with sharp detail and accurate colors, and the latest graphics and processors, offering the perfect blend of performance, mobility and durability. Incorporating select aspects of the Latitude line, the XPS laptops are fully manageable, and come with best-in-class security features for commercial appeal. The ultra-thin 23.8-inch Inspiron 24 7000 Series All-in-One desktop features a 3D camera with Intel® RealSense™ technology and Windows Hello for an intuitive and immersive user experience. Built with an articulated stand, the screen can be tilted 65 degrees or even laid flat for the most comfortable viewing angle. Separately, the Inspiron 24 3000 Series comes with a stunning 23.8-inch Full HD wide-angle display with IPS technology. This space-saving all-in-one desktop comes with built-in speakers; a pop up easel stand with one-cord set up for quick and easy set-up, and the latest Intel processors for responsive performance and uncompromising visuals so families can immerse themselves in movies and games. Users can stream music and movies quickly and securely with built-in wireless technology, and connect seamlessly to other devices with the multiple ports available. A versatile 2-in-1 device with a 15.6-inch display, the new Inspiron 15 7000 Series 2-in-1 combines the beauty and strength of brushed aluminum with upscale features and an impressive battery life. The Inspiron 13 7000 Series 2-in-1 will debut in a new design with curved edges, a metal palm rest and a diamond cut touch pad. Both 2-in-1s rotate between four modes: tablet, laptop, tent and stand mode; the latter is perfect for resting on an airplane tray table to watch movies at an optimal angle, no matter how far back the facing seat is reclined. True Color comes standard on these 7000 Series 2-in-1 PC with its wide-viewing angle IPS screen for a vibrant visual experience. The new Inspiron 15 7000 performance notebook is boldly designed in black and red with contrasting accents. The notebook is ideal for students and young gamers seeking a multi-usage high performance laptop for school work, multimedia and gaming needs at just the right price. Visuals will pop with 4GB GDDR5 performance class discrete graphics from NVIDIA and also comes with a 4K UHD touch option. The notebook is built to last with a 74Whr battery so users can enjoy long battery life for on-the-go gaming and productivity. Intelligently engineered cooling solutions sustain uninterrupted game time. The Inspiron 14 and 15 5000 Series offer well-designed laptops which include sharp high resolution displays, firm keyboards that are easy to type on for hours, exceptional battery life, and great wireless performance. An optional touch display is available in either FHD 1080p resolution on the 15-inch model, or in HD (14- and 15-inch). In addition to premium performance and stunning visuals, stylish shoppers will enjoy the laptops’ sleek design details and vibrant color options, selecting from several finishes: Beijing Red, Standard Black, Theoretical Gray, Alpine White and Sky Blue. At less than 19mm thin, the new 14-inch Vostro 5000 Series notebook balances design and performance for working professionals who demand fast processing power and no-nonsense business features to get their work done. Whether managing operations at a restaurant or freelancing from a home office, workers will maneuver through spreadsheets and presentations with ease. The Vostro 14 5000 Series is beautifully crafted in either Era Grey or Jingle Gold anodized aluminum, and delivers up to nine hours of battery life for everyday mobile productivity. For more demanding graphics-rich applications or uninterrupted multi-tasking, users can opt for built-in discrete graphics from NVIDIA with up to 2GB memory and up to 8GB of high-speed RAM. The Vostro 14 also comes with an easy-to-use and reliable security solution featuring a fingerprint reader and Windows 10 biometric recognition features for commercial users to log in with just a swipe.